An interest rate swap is a type of a derivative contract through which two counterparties agree to exchange one stream of future interest payments for another, based on a specified principal amount. In most cases, interest rate swaps include the exchange of a fixed interest rate for a floating rateFloating Interest RateA floating interest rate refers to a variable interest rate that changes over the duration of the debt obligation. It is the opposite alternative to a fixed interest rate loan, where the interest rate remains constant throughout the life of the debt.. Similar to other types of swaps, interest rate swaps are not traded on public exchangesStock MarketThe stock market refers to public markets that exist for issuing, buying and selling stocks that trade on a stock exchange or over-the-counter. Stocks, also known as equities, represent fractional ownership in a company – only over-the-counterTrading Mechanisms - TradingTrading mechanisms refer to the different methods by which assets are traded. The two main types of trading mechanisms are quote driven and order driven trading mechanisms (OTC). Interest rate swaps usually involve the exchange of one stream of future payments based on a fixed interest rate for a different set of future payments that are based on a floating interest rate. Thus, understanding the concepts of fixed-rate loans vs. floating rate loans is crucial to understanding interest rate swaps. A fixed interest rate is an interest rate on a debt or other security that remains unchanged during the entire term of the contract, or until the maturity of the security. In contrast, floating interest rates fluctuate over time, with the changes in interest rate usually based on an underlying benchmark index. Floating interest rate bonds are frequently used in interest rate swaps, with the bond’s interest rate based on the London Interbank Offered Rate (LIBOR). Briefly, the LIBOR rate is an average interest rate that the leading banks participating in the London interbank market charge each other for short-term loans. The LIBOR rate is a commonly used benchmark for determining other interest rates that lenders charge for various types of financing. 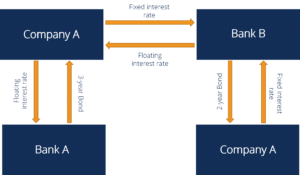 How Does an Interest Rate Swap Work? Basically, interest rate swaps occur when two parties – one of which is receiving fixed rate interest payments and the other of which is receiving floating rate payments – mutually agree that they would prefer the other party’s loan arrangement over their own. The party being paid based on a floating rate decides that they would prefer to have a guaranteed fixed rate, while the party that is receiving fixed rate payments believes that interest rates may rise, and to take advantage of that situation if it occurs – to earn higher interest payments – they would prefer to have a floating rate, one that will rise if and when there is a general uptrend in interest rates. In an interest rate swap, the only things that actually get swapped are the interest payments. An interest rate swap, as previously noted, is a derivative contract. The parties do not take ownership of the other party’s debt. Instead, they merely make a contract to pay each other the difference in loan payments as specified in the contract. They do not exchange debt assets, nor pay the full amount of interest due on each interest payment date – only the difference due as a result of the swap contract. A good interest rate swap contract clearly states the terms of the agreement, including the respective interest rates each party is to be paid by the other party, and the payment schedule (e.g., monthly, quarterly, or annually). In addition, the contract states both the start date and maturity date of the swap agreement, and that both parties are bound by the terms of the agreement until the maturity date. Note that while both parties to an interest rate swap get what they want – one party gets the risk protection of a fixed rate, while the other gets the exposure to potential profit from a floating rate – ultimately, one party will reap a financial reward while the other sustains a financial loss. If interest rates rise during the term of the swap agreement, then the party receiving the floating rate will profit and the party receiving the fixed rate will incur a loss. Conversely, if interest rates decline, then the party getting paid the guaranteed fixed rate return will benefit, while the party receiving payments based on a floating rate will see the amount of the interest payments it receives go down. Let’s see exactly what an interest rate swap agreement might look like and how it plays out in action. In this example, companies A and B make an interest rate swap agreement with a nominal value of $100,000. Company A believes that interest rates are likely to rise over the next couple of years, and aims to obtain exposure to potentially profit from a floating interest rate return that would increase if interest rates do, indeed, rise. Company B is currently receiving a floating interest rate return, but is more pessimistic about the outlook for interest rates, believing it most likely that they will fall over the next two years, which would reduce their interest rate return. Company B is motivated by a desire to secure risk protection against possible declining rates, in the form of getting a fixed rate return locked in for the period. The two companies enter into two-year interest rate swap contract with the specified nominal value of $100,000. Company A offers Company B a fixed rate of 5% in exchange for receiving a floating rate of the LIBOR rate plus 1%. The current LIBOR rate at the beginning of the interest rate swap agreement is 4%. Therefore, to start out, the two companies are on equal ground, with both receiving 5%: Company A has the 5% fixed rate, and Company B is getting the LIBOR rate of 4% plus 1% = 5%. Now assume that interest rates do rise, with the LIBOR rate having increased to 5.25% by the end of the first year of the interest rate swap agreement. Let’s further assume that the swap agreement states that interest payments will be made annually (so it is time for each firm to receive its interest payment) , and that the floating rate for Company B will be calculated using the prevailing LIBOR rate at the time that interest payments are due. Company A owes Company B the fixed rate return of $5,000 (5% of $100,000). However, since interest rates have risen, as indicated by the benchmark LIBOR rate having increased to 5.25%, Company B owes Company A $6,250 (5.25% plus 1% = 6.25% of $100,000). To avoid the trouble and expense of both parties paying the full amount due to each other, the swap agreement terms state that only the net difference in payments is to be paid to the appropriate party. In this instance, Company A would receive $1,250 from Company B. Company A has profited from accepting the additional risk inherent with accepting a floating interest rate return. Company B has suffered a loss of $1,250, but has still gotten what it wanted – protection against a possible interest rate decline. Let’s see how things would look if the interest rate market had moved in the opposite direction. What if at the end of the first year of their agreement, the LIBOR rate had fallen to 3.75%? With its fixed rate return, Company B would still be owed $5,000 by Company A. However, Company B would only owe Company A $4,750 (3.75% plus 1% = 4.75%; 4.75% of $100,000 = $4.750). The would be resolved by Company A paying $250 to Company B ($5,000 minus $4,750 = $250). In this scenario, Company A has incurred a small loss and Company B has reaped a benefit. Interest rate swaps are an effective type of derivative that may be of benefit to both parties involved in using them, in a number of different ways. However, swap agreements also come with risks. One notable risk is that of counterparty risk. Because the parties involved are typically large companies or financial institutions, counterparty risk is usually relatively low. But if it should happen that one of the two parties defaults and is unable to meet its obligations under the interest rate swap agreement, then it would be difficult for the other party to collect. It would have an enforceable contract, but following the legal process might well be a long and twisting road. Just dealing with the unpredictable nature of floating interest rates also adds some inherent risk, for both parties to the agreement.